When Ebola strikes, what is the proper response? What measures should be taken to protect communities in a time of crisis? Should a neighborhood be quarantined? How? To help answer these questions, public health officials in Liberia turn to legal experts at the UNC School of Government. 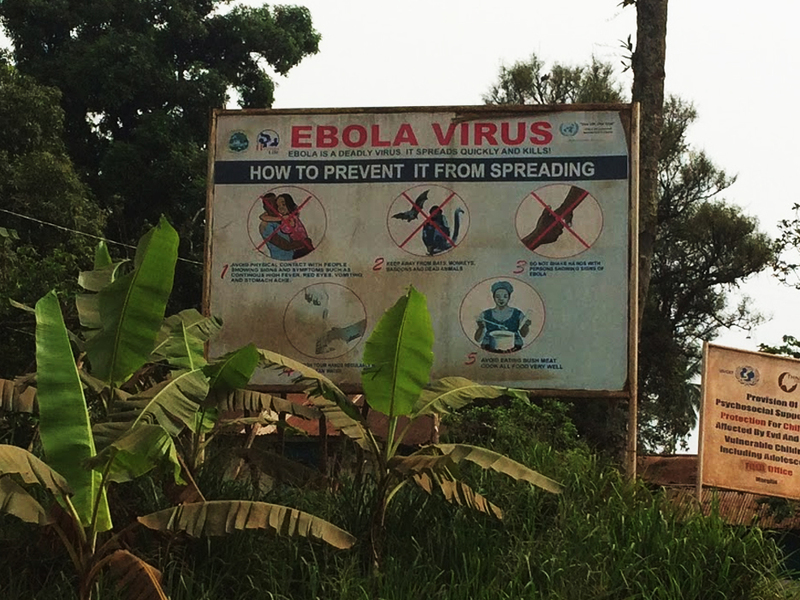 During the 2013 Ebola outbreak in Liberia, government officials placed signs across the country to convince people the virus was a real threat. But fewer than 50 percent of Liberia's population can read. Today is April 2, 2016, and a new case of Ebola has just been reported in Monrovia, Liberia — where Wall is heading tomorrow. In October 2015, Wall received a phone call from Francis Kateh, the chief medical officer for the Liberian Ministry of Health. Kateh knew Wall from a decade earlier when he served as the health director in Anson County, North Carolina. At that point, in the fall of 2015, the worst of the Ebola outbreak was over, and Kateh and his colleagues were busy looking for ways to better prevent and control future outbreaks. In order to quarantine a house, or a neighborhood, there must be a law on the books that details how and when to do that — and public officials must know it. It’s a bit like having highways and state patrol officers, but no one knows the speed limit. The infrastructure is there, but the knowledge is not. Next he wanted Wall and her colleagues at the School of Government to help a team of Liberian attorneys and officials rewrite old laws and draft new legislation to bring Liberia’s health codes up to date. “We help legislators draft legislation to do those exact things in North Carolina, and Dr. Kateh knew that,” Wall says. Three ambitious and arduous goals — in a complicated country recently ravaged by a terrible virus. “There weren’t a lot of people who were willing to take that on,” Wall says. But she told Kateh she would look into it. Of the 10,666 reported cases of Ebola in Liberia, about half of the people survived. UNC doctors are testing the blood of survivors in hopes of creating an Ebola vaccine. The West African Ebola virus epidemic began in Dec. 2013, peaked in Oct. 2014, and ended in summer 2016. The new case reported in Liberia in April 2016 infected four people, one of whom died. The latest research implicates bats as the hosts of the Ebola virus, according to the CDC. Liberia’s history of governance is complicated at best. The last decade, while relatively peaceful, was proceeded by 20 years of bloody wars, a 10-year period of dictatorship, and over a hundred years of one-party rule, gouging a deep distrust of government and democracy in the Liberian psyche. That distrust played a major role in the chaos and devastating loss of life caused by Ebola. West Point is a slum on the peninsula of Monrovia and home to roughly 75,000 of the city’s most impoverished residents. With no access to running water and only four communal toilets, it is exactly the kind of place that breeds disease. When officials started reporting cases of Ebola in West Point, the government reacted impulsively. “They were asking questions about public health and emergency powers, and what tools they had available, but no one knew what to do,” Wall says. With no good protocol in place, President Ellen Johnson Sirleaf ordered the army to quarantine the slum on August 20, 2014. When armed soldiers rolled into the neighborhoods and began erecting barricades, they were met by hundreds of angry and terrified people. Soldiers fired shots into the air in an attempt to disperse the swelling crowd. In the chaos and confusion that ensued, four people were injured and a 15-year-old boy was fatally shot. 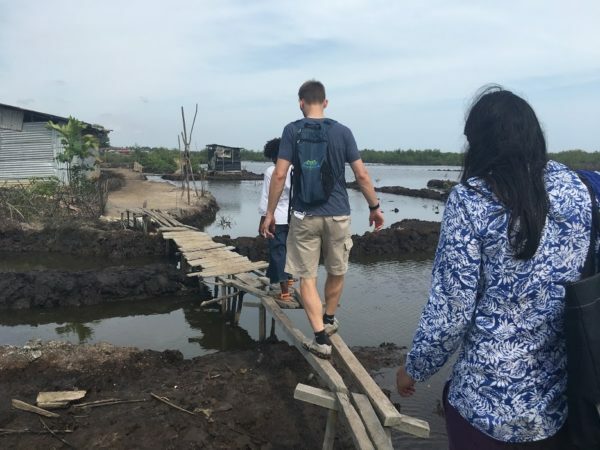 [/media-credit] Jeff Austin and other members of the team from UNC and the CDC walk across a makeshift bridge in a neighborhood outside Monrovia. Liberia is home to a tropical climate where the air hangs heavy with heat and humidity year-round. During the rainy season (May through October) water pours from the sky, saturating the earth for days on end. The intense rain often washes out bridges and roads, making travel and communication to remote villages nearly impossible. This presents yet another major challenge for public health officials to cope with when Ebola hits. “We heard that this area was experiencing an outbreak and the people living there didn’t understand it,” Wall says, pointing to a county outside of Monrovia on a map. “The public health officials and volunteers had to park their cars and walk for two days to explain the proper protocol to the tribal leaders there.” In remote areas, people have almost no contact or connection with government officials — their trust lies solely in the tribal leaders. Jeff Austin and other members of the team from UNC and the CDC walk across a makeshift bridge in a neighborhood outside Monrovia. Photo by Emily Rosenfield, courtesy of the CDC. Across the country, officials erected huge billboards declaring “Ebola is real” in an attempt to convince people that the virus is indeed a real threat, and not some sort of government conspiracy. Seemingly every facet of public health protocol was met with misunderstanding at best and animosity at worst. In Liberia, burning a dead body is a massive taboo. More than a year has passed since Ebola swept across the country, but the men who helped end the epidemic — the “body burners” — are still shunned by their communities. As she began contacting people, she realized Kateh may have reached out to the right person after all. “There are lots of people that could teach him about the foundations of public health law and the public health system, but there weren’t too many people who were willing to go in and actually help rewrite the laws,” Wall says. A pro bono group of attorneys provided assistance several years ago through the International Senior Lawyers’ Project and the new team was able to build on much of their good work. But legal resources are scarce and attorneys trained in public policy, public health, and legislative drafting are even scarcer. Wall sees an opportunity to help her new friends and colleagues in Liberia build their internal capacity to do the kind of work that the school does in North Carolina. She has been working especially closely with Tomik Vobah, the General Counsel for the Ministry of Health in Liberia. Vobah visited Chapel Hill this past fall to learn more about our public health and legal systems. He also spent time with Gene Matthews, the former General Counsel for the CDC and Senior Fellow at the Gillings School of Global Public Health, who introduced Vobah to national and international experts in order to help him build out his own public health law network. Wall hopes that these relationships — with UNC, the CDC, and many others — will help give Vobah the support he needs to become a leader in this field for his country and region. Aimee Wall is the Thomas Willis Lambeth Distinguished Chair in Public Policy at the UNC School of Government. Benjamin Mason Meier is the Zachary Taylor Smith Distinguished Professor of Public Policy and an Associate Professor of Global Health Policy in the Department of Public Policy in the UNC College of Arts & Sciences. Jeff Austin is a research associate at the UNC School of Government, and has worked in Liberia through the Carter Center.